So I have a domain registered with Google Apps that I use for testing and development. It's a Standard Edition with only a few users, all of which use English. So basically, this domain met the criteria for becoming an early adopter of the transition to the new Google Apps infrastructure. The infrastructure that basically makes a google apps account operate just like a regular Google Account. So I transitioned this domain. And sure enough I get the "Organization" tab in the dashboard that allows me to turn services on and off for accounts in an organization of the domain. Unfortunately, at least for my purposes, since a Standard Edition account can only have one organization, I cannot test creating multiple organizations and creating access privileges to certain users based on their organization. The other thing you may notice is that the services you can turn on and off are the same core services from prior to transitioning to the new infrastructure. I was hoping to be able to control which Google Services, now that accounts from my domain can register for a whole host of google services. I was hoping that this lack was just part of being an "early adopter". But no, apparently this is all there is and all that is planned although Google has left the door ajar for adding other services later. So what this says to me is that Google is going to open the flood gates to their services without providing me the control of that for accounts I issue. Even if they add services later that's an administrative nightmare to start denying services to users that have already signed up/registered for a service. I have to qualify that for now as I'm an early adopter so those services may be in place by the time google apps users will unilaterally be transitioned. But I also have to assume that, and this is partially based on my experience with Google services up until this point, that in fact other services won't be ready for control on the dashboard. And if that's the case, and if I were anything but a Standard Edition user I would not be a happy camper. Granted the infrastructure change makes it easier to register for other Google services with my Google Apps account, and that for Neohawk.org this is a great thing! However, this typical Google tendency not to think things through makes my life much harder. For example, the reality is that prior to the infrastructure change you could "associate" a google account with a google apps account making for pretty much seamless integration with other google services. So the transition means that I need to go to the effort of dismantling all of that. Again, for neohawk.org, not a big deal. For JANO though, that becomes problematic. And if I were a Premier Edition user I'd not be a happy camper. 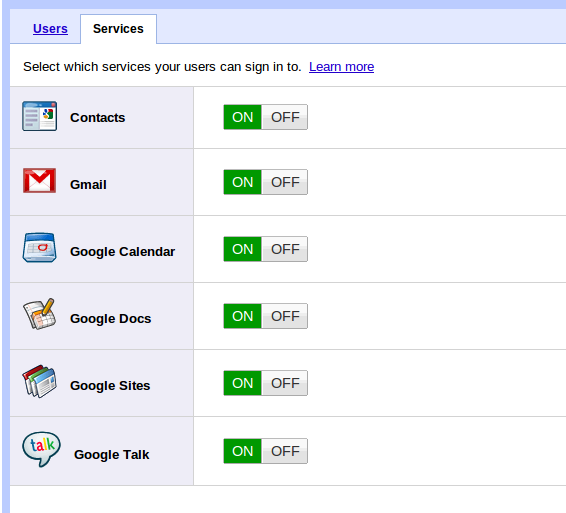 However, one of the main reasons I did not have my JANO users associate their JANO google apps account with a Google account was that if you logged into a service that required a Google Account, the Google navigation menu changed to Google account menu. What that meant is that when you clicked on "Calendar" you would be sent to the Google Account calendar, not the Google App account calendar. Talk about end-user confusion! I am happy to report that the navigation upon transitioning to the new infrastructure works as I would expect. The navigation menu sends you to your Google Apps calendar. This is clearly an upgrade and makes the transition highly welcome if I'm not being a stickler about being able to control which Google services my domain users can use outside of the core listed above. For the Neohawk.org domain, I'm a happy camper. For the JANO domain, I'm still not convinced that the migration to the new platform helps me in any significant way. I won't really know that until the transition is forced upon me whether I like it or not. The JANO web team will be able to use their JANO accounts for logging in and posting to the blog, but they already have that capability with the Google accounts they had to set up to begin with in the first place. I should mention that JANO is also a Standard Edition until we can, if we can, change the status of JANO from a 501c4 to 501c3 to take advantage of the Not-for-profit Edition. So I'd have to say I'm glad for the change as it relates to Neohawk, completely ambivalent as it relates to JANO (disappointed really since I had higher expectations), and I would be pissed if I were a paying customer due to the lack of control over other Google Services. Again, with the caveat that I'm basing it on my test, standard edition Google Domain and I'm an "early adopter". Things may change over the next month or two as they gear up for the real transition.